Earlier this year, Shahid Kapoor was seen in Sanjay Leela Bhansali’s Padmaavat. On the other hand Shraddha Kapoor is currently been seen in Stree. None of the two films warranted that the two actors break into a Bollywood style song-n-dance affair. 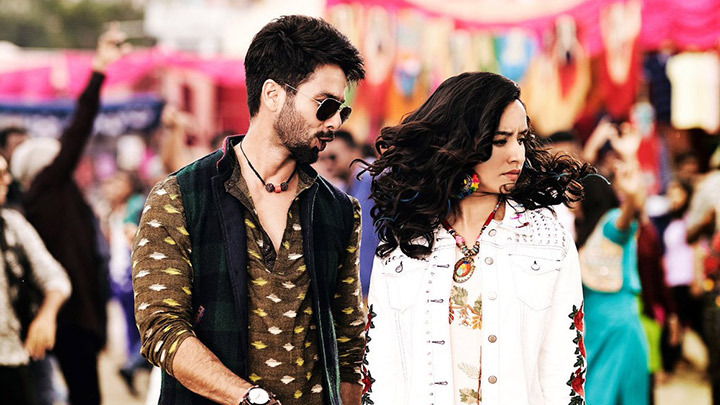 However, they would be pretty much looking at doing that in their next release together Batti Gul Meter Chalu which has multiple composers creating music with Siddharth-Garima taking of the lyrics department. Shahid Kapoor gets into the ‘Saree Ke Fall Sa’ [R… Rajkumar] mode with ‘Gold Tamba’ which has been sung with aplomb by Nakash Aziz. With out and out ‘tapori’ lyrics at his disposal, composer Anu Malik lets his hair down for ‘Gold Tamba’ which is catchy to the core and makes you tap your feet instantly. A fun number all the way, it may be scoffed by the class audience but would be lapped up by the masses. Nusrat Fateh Ali Khan’s ‘Dekhte Dekhte’ (which was written and composed by him) is recreated by Rochak Kohli and Manoj Muntashir. Well, the effect is indeed good as first Atif Aslam and later Rahat Fateh Ali Khan come up with a version of their and do well with their rendition. A song about how love changes shades in a matter of time, ‘Dekhte Dekhte’ could well be picked by those with a broken heart. That said, the song never gets into a boring ‘dard-e-judaai’ mode and instead stays on to be reasonably lively, given the kind of genre that it belongs to. It is back to fun-n-frolic with ‘Hard Hard’ which is put together by the new composer team of Sachet-Parampara. In fact Sachet also comes behind the mike along with Mika Singh and Prakriti Kakar for this celebration number which somehow resembles the stage and setting of a Bhojpuri number. A just about fair number, one could have possibly bargained for a somewhat better outing considering it is a Shahid Kapoor-Shraddha Kapoor film. Sachet-Parampara get one more song to their name in the form of ‘Har Har Gange’ which is a situational piece. As a matter of fact Arijit Singh is a very unique choice for a song like this as one would have rather expected him to render yet another version of ‘Chalte Chalte’. However what you get to hear is a devotional number that is just about passable and may just about help the film’s narrative to some extent. The soundtrack of Batti Gul Meter Chalu is a mixed bag though presence of ‘Gold Tamba’ and ‘Dekhte Dekhte’ means it would eventually find traction in the short and long run respectively.